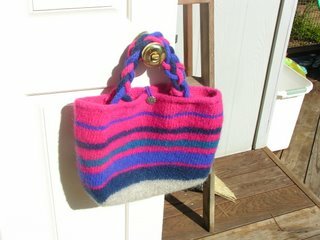 For my second felted bag I took the leftover yarn from a felted bag my Mom had made and designed this bag. I took the design from the first bag and made some changes to come up with my own design. I gave this one to my Mom yesterday for Mother's Day and she really liked it. Then for the Just Bag It exchange for the Month of May I followed the bowling ball bag pattern. 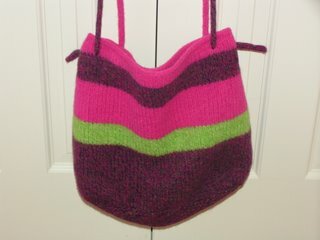 Now this is the most "complicated" pattern I have used for a felted bag but I'm happy how it turned out. Also I didn't like the handles in the pattern so I created my own. I wanted a shoulder strap and I needed triangles to match the bag so I made a mini multi-directional scarf. Here it is - I think I'm keeping this one for myself! Now I'm on to bag #4 - I can't tell you too much about it because it is for my Tote Exchange partner. I'm thrilled with the colors and how it is turning out. I can't wait to tell you all the pattern but that will have to wait. So why is it that I now love felting bags? Is it the mystery of what you'll get when you're done? Is it the fact that at the end you have something useful? 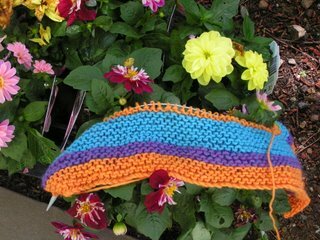 Or is it the fact that garter stitch is mindless and sometimes I just need a break? I don't know for sure but I do know there's more felt in my future! 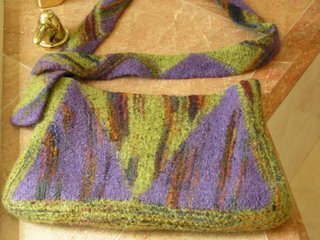 TODAY'S QUESTION: What's your favorite felted bag pattern? I like the bowling bag - love the triangles. Is that a free pattern or one you purchased? Looks really cool. Great strap too. How inventive. Isn't felting fun!!! Hey Crafty Bernie - I tried to find an e-mail from you but can't. The Bowling Bag pattern is free - there is a link on the Ohhh Bag Me site. Let me know if you can't find it! Glad you like it.